Below are details on the methodologies used throughout this plan development. Air Quality. The i-Tree Canopy v6.1 Model was used to quantify the value of ecosystem services for air quality. i-Tree Canopy was designed to give users the ability to estimate tree canopy and other land cover types within any selected geography. The model uses the estimated canopy percentage and reports air pollutant removal rates and monetary values for carbon monoxide (CO), nitrogen dioxide (NO2), ozone (O3), sulfur dioxide (SO2), and particulate matter (PM) (Hirabayashi 2014). Within the i-Tree Canopy application, the U.S. EPA’s BenMAP Model estimates the incidence of adverse health effects and monetary values resulting from changes in air pollutants (Hirabayashi 2014; US EPA 2012). Different pollutant removal values were used for urban and rural areas. In i-Tree Canopy, the air pollutant amount annually removed by trees and the associated monetary value can be calculated with tree cover in areas of interest using BenMAP multipliers for each county in the United States. To calculate ecosystem services for the study area, canopy percentage metrics from UTC land cover data performed during the assessment were transferred to i-Tree Canopy. Those canopy percentages were matched by placing random points within the i-Tree Canopy application. Benefit values were reported for each of the five listed air pollutants. Carbon Storage and Sequestration. The i-Tree Canopy v6.1 Model was used to quantify the value of ecosystem services for carbon storage and sequestration. i-Tree Canopy was designed to give users the ability to estimate tree canopy and other land cover types within any selected geography. The model uses the estimated canopy percentage and reports carbon storage and sequestration rates and monetary values. Methods on deriving storage and sequestration can be found in Nowak et al. 2013. To calculate ecosystem services for the study area, canopy percentage metrics from UTC land cover data performed during the assessment were transferred to i-Tree Canopy. Those canopy percentages were matched by placing random points within the i-Tree Canopy application. Benefit values were reported for carbon storage and sequestration. Stormwater. The i-Tree Hydro v5.0 Model was used to quantify the value of ecosystem services for stormwater runoff. i-Tree Hydro was designed for users interested in analysis of vegetation and impervious cover effects on urban hydrology. This most recent version (v5.0) allows users to report hydrologic data on the city level rather than just a watershed scale giving users more flexibility. For more information about the model, please consult the i-Tree Hydro v5.0 manual (http://www.itreetools.org). To calculate ecosystem services for the study area, land cover percentages derived for the project area and all municipalities that were included in the project area were used as inputs into the model. Precipitation data from 2005-2012 was modeled within the i-Tree Hydro to best represent the average conditions over an eight year time period. Model simulations were run under a Base Case as well as an Alternate Case. The Alternative Case set tree canopy equal to 0% and assumed that impervious and vegetation cover would increase based on the removal of tree canopy. Impervious surface was increased 6% based on the amount of impervious surface under tree canopy and the rest was added to the vegetation cover class. This process was completed to assess the runoff reduction volume associated with tree canopy since i-Tree Hydro does not directly report the volume of runoff reduced by tree canopy. The volume (in cubic meters) was converted to gallons to retrieve the overall volume of runoff avoided by having the current tree canopy. Through model simulation, it was determined that tree canopy decreases the runoff volume in the project area by 1.23 billion gallons per year using precipitation data from 2005-2012. This equates to approximately 13,406 gallons per acre of tree canopy (1.23 billion gals/91,608 acres). Energy Saving (Cooling). Trees have a profound effect on building energy and has been studies using various methods (Carver et al. 2004; McPherson and Simpson 2003). The process of estimating energy (electricity) savings starts with determining the number of 1-unit structures by vintage (age) class within each census block group. Vintage refers to construction type for a building (i.e. average floor area, floor types, insulation (R-value), and number of stories) and was broken into three categories: pre-1950, 1950-80, and post-1980. Census data obtained from the 2010 American Community Survey (Table B25024 – UNITS IN STRUCTURE and Table B25034 - YEAR STRUCTURE BUILT) was used to determine the number of 1-unit structures. The data was based on 5-year estimates. Since the number of 1-unit structures differed at the block group level, the number of 1-unit structures was determined by vintage and block group by multiplying the percentage of units in each vintage by the total number of 1-unit structures in each block group (McPherson et al. 2013). For each block group, total energy savings were tallied for each block group using a function of percent UTC, vintage class, and energy saving coefficients (McPherson and Simpson 2003, McPherson et al. 2013). Prices for ecosystem services in 2016. Property Value. Many benefits of tree canopy are difficult to quantify. When accounting for wildlife habitat, well-being, shading, and beautification, these services are challenging to translate into economic terms. In order to provide some estimation of these additional services, this report calculated a property value based on the value of home prices for the City of Charlotte. Limitations to this approach include determining actual value of individual trees on a property and extrapolation of residential trees to other land use categories (McPherson et al. 2013). In a study completed in 1988, it was found that single-family residences in Athens, GA had a 0.88% increase in the average home sale price for every large front-yard tree on the property (Anderson and Cordell 1988). Using this study, the sales price increase was utilized as an indicator of additional tree benefits. While home sales vary widely, in 2016, the median home sales value in the City of Charlotte was $174,200. Using this median sales price and multiplying by 0.88%, the value of a large front-yard tree was $1,533. To convert this value into annual benefits, the total added value was divided by the leaf surface area of a 30 year old shade tree ($1,533/5,382ft2) which yields a base value of $0.25/ft2. Using methodology from McPherson et al. 2013 to convert into units of UTC, the base value of tree canopy was determined to be $0.23 ft-2 UTC. Since this value was derived using residential land use designations, transfer functions were used to adapt and apply the base value to other land use categories. To be conservative in the estimation of tree benefits, the land use reduction factors calculated property value at 50% impact for single-family residential parcels, 40% for multi-residential parcels, 20% for commercial parcels, and 10% for all other land uses (table below). The price per unit of UTC values were multiplied by the amount of square feet of tree canopy within each land use category and summarized by neighborhoods. Land use reduction transfer function values. Three models to project future tree canopy were used in this plan. A brief methodology for each one follows. Model 1: Aging Street Tree Model​. Using Charlotte’s street tree inventory data for the neighborhoods of Myers Park and Grier Heights (known to have many mature street trees), changes in the tree population was forecasted. 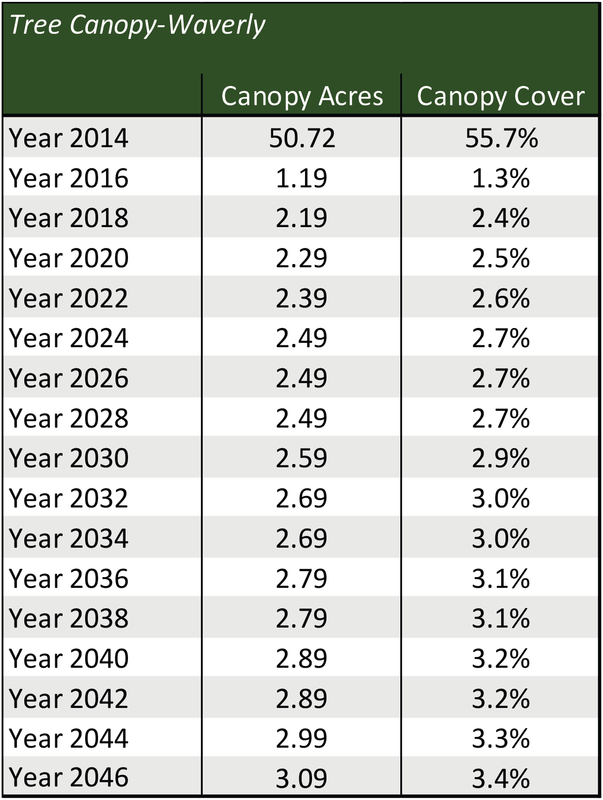 The purpose of this forecast is to predict how the aging population and planting rates would affect canopy cover and benefits between 2016 and 2050. Of Myers Park’s 6,260 street trees, 21% are greater than 24 inches DBH (considered large mature trees) and overall tree canopy covers 85 acres. Charlotte planting records showed that on average 40 trees are planted in Myers Park each year. Of Grier Heights 751 street trees, 14% are greater than 24 inches DBH (considered large mature trees) and overall tree canopy covers 9 acres. Charlotte planting records showed that on average, 1 tree is planted in Grier Heights per year. Average growth rate is species and location specific, and is provided by i-Tree. Annual mortality rates use: 3% in healthy trees, 13% in sick trees, and 50% in dying trees. ​Eco Forecast is a separate component of i-Tree Eco that uses the structural estimates (e.g., number of trees, species composition) generated by running the i-Tree Eco model, along with anticipated growth and mortality rates to estimate what the urban forest will look like in the future." Read more about Eco Forecast. First, 2014 and 2016 LiDAR (Light Detection and Ranging), a remote sensing method used to detect different types of land cover, was used to calculate the number of acres in five categories. These five categories are Grass/Low-Lying Vegetation, Bare Soil, Impervious Surfaces, Open Water, and Tree Canopy. Next, using the approved site and landscaping plans, a detailed list of the number and types of trees was compiled. This information was used to run the ​Eco Forecast tool ​from i-Tree Eco to calculate the change in tree canopy cover over time on current development sites. Annual mortality rates use: 1.5% in healthy trees, 13% in sick trees, and 50% in dying trees. One storm event at year 10, which eliminated 5% of trees. No pest out breaks. ​Presented below are the acreages for all land cover types by subdivision and specific assumptions, as not all site plans provided the same level of information. For each subdivision tree save areas and all on site mitigation were included in the tree canopy acreage. Two important factors to keep in mind 1. tree canopy cover is not mutually exclusive form other categories (i.e. impervious surface can be under tree canopy) and 2. calculations are for only on-site and tree canopy numbers do not include offsite mitigation efforts. ​Note: ​For both residential and commercial land uses it is assumed about 75% impervious surface. The tables below were used to make the line graphs present in the What's at Risk section. Future canopy was projected in this model using the City of Charlotte's future land use map available on Charlotte's Open Data portal ​and the most recent data on tree canopy by land use, derived from the 2012 urban tree canopy assessment in Charlotte. 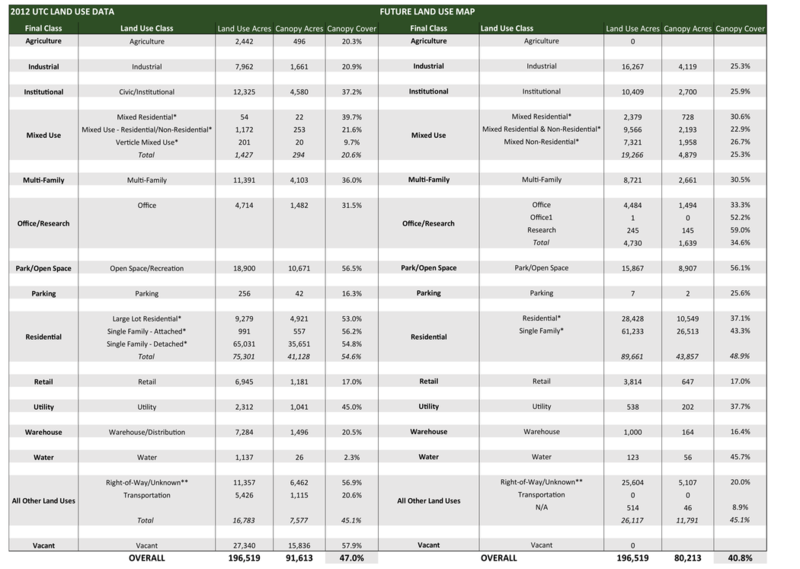 First the quantity amount of future land use acres were calculated from the future land use map. 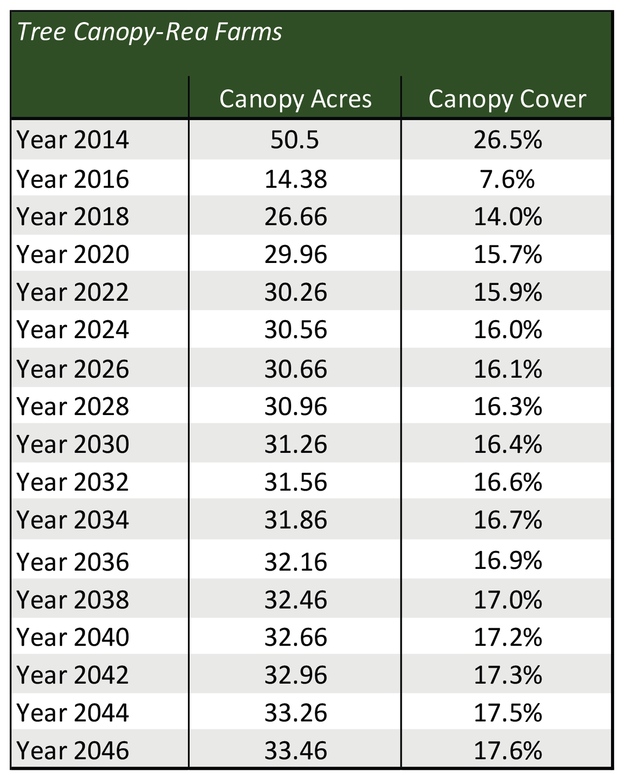 Then current tree canopy percentages for each land use (from 2012 UTC) were applied to future land use to calculate future canopy acres. There is a 6% decrease in canopy overall due to the change in land use. Two groups of land uses were modified with the percentages of tree canopy found in the subdivision analysis. 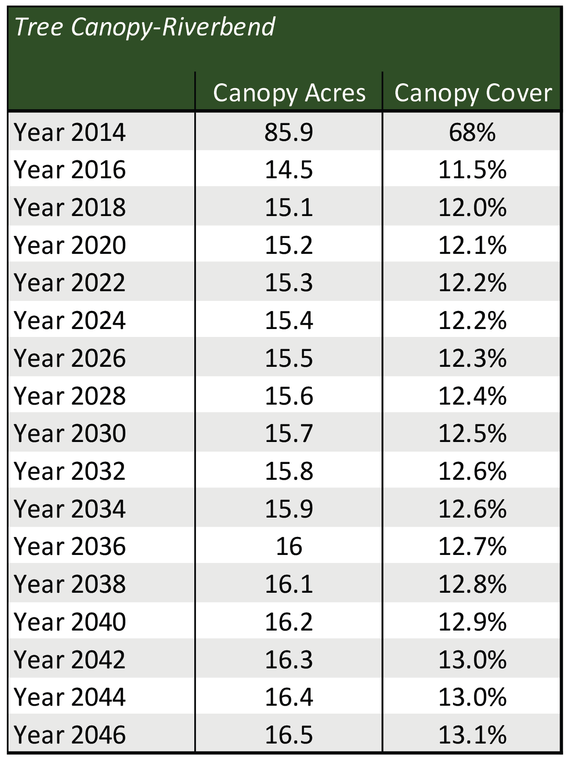 Rea Farms' final tree canopy cover percentage (17%) was applied to all added residential acres between 2012 and the future land use. Similarly, Riverbend developments final tree canopy cover percentage (13%) was applied to all new mixed use acres. * Future canopy acres were estimated using the outcomes of the subdivision analysis. **The land use was setup by parcel and didn't cover the full extent of the city. This category exists to show the remaining area that wasn't assigned a land use class.